Perfection is a quality much sought after in our world but very rarely realised; however with Moana, a superlative animated feature film by just about any measure, Disney has come impressively close to this well-nigh impossible goal. Directed by Ron Musker and John Clements, Moana is the product of extensive consultation with Polynesian people and experts throughout the Pacific, the result of a desire to ensure the film accurately reflected the vital culture of a seafaring people who have a long and rich history stretching down through millennia. Not only is this long held body of belief and custom given its due reverence and respect, but it’s accomplished through sumptuous visuals, beautifully fleshed out characters who come alive in every single scene they’re in, songs that will be in your head for days courtesy of the enormously talented Lin-Manual Miranda and a pleasing degree of wit and plain old goofiness, much of it courtesy of a knucklehead chicken called Heihei (Alan Tudyk) and the chemistry between the two lead characters, Moana Waialiki (Auli’i Cravalho) and Maui (Dwayne Johnson). These two highly-engaging characters are among the best partnerships Disney has ever form on film and it has a history of bringing some pretty winning partnerships such as Pinocchio and Jiminy Cricket, Dumbo and Timothy, Mary Poppins and Bert, and Timon and Pumbaa. Starting out, as all good enduring friendships do, on film at least, as highly-annoying frenemies who are almost obliged to work with each other to fulfill a prophecy, Moana and Maui develop a rich and easy partnership, borne literally in fire and the slings and arrows of Kakamora pirates. It’s a joy to watch the way in which the daughter of a village chief, who is chosen by the ocean itself – who becomes a deeply amusing and meaningful character in its own right, reflecting the Polynesian belief in the primacy of the sea as the giver of life – to return the stone of Te Fiti to its original home, and demigod Maui, who has faced imprisonment on a desert island for 1000 years, come together to work to restore the islands of the Pacific to their original verdant selves. There the usual amount of bickering, belittling and banging together of heads as earnest, determined Moana, committed to looking after her people come what may, and Maui, who originally stole the stone for, it turns out, some good, if misguided reasons, differ over how best to accomplish this goal. Or in the case of Maui, whether to even attempt it at all. That they do bond together is, of course, a foregone conclusion but how it comes to pass is a joy to watch, a beguiling blend of slapstick comedy, fierce unyielding clashing of wills and some genuinely sweet, heart-swelling moments that remind you again and again than when Disney are at their best, and they most definitely are in the case of Moana, that they are an emotional force with which to be reckoned. 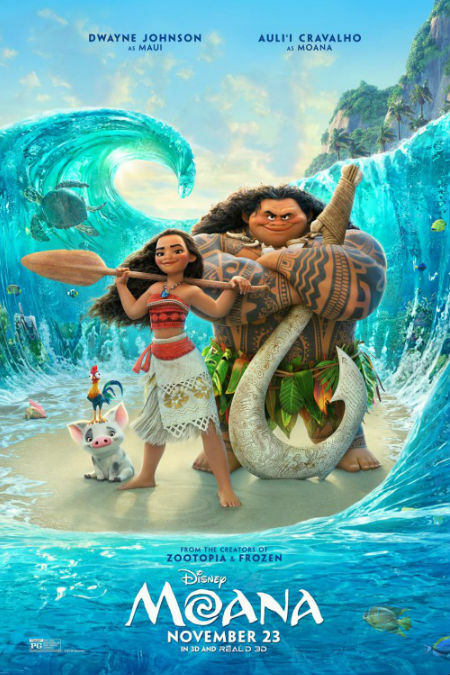 It’s well near impossible to watch the way in which Moana, a restless soul who has always felt the call of the sea, in spite of her father’s (Temuera Morrison) loving prohibition but egged on by eccentric grandmother Gramma Tala (Rachel House) and Maui, who wants to reclaim his magical hook from the Realm of Monsters where it is guarded by a giant bling-rich crab called Tamatoa, come together without being deeply and irrevocably affected. Moana is not simply able to tell a magnificently-rich story very, very well, it is able to do so with characters who sing, literally and figuratively, who leap off the screen with such vivacity and life that you can help but fall in love with them as they come to appreciate how much each needs the other. It’s not cloying or forced or manipulative in any way; rather it feels so innately natural that you come to appreciate how shoehorned many other character partnerships in lesser animated films feel. The lessons learned too feel authentic, the result of two wildly disparate people coming to understand not only the cultural imperatives of their people, and why they matter so much, but also the importance of friendship, selfless collaboration and tenacity. At no time is there a sense that any of this lesson-learning is forced and Moana keeps an easygoing, bright, fun-filled meaningful throughout its running time, deftly balancing the lighter and darker shades of its storytelling palette. The visuals are utterly immersive in every way. With the ocean playing such a central role in the film, courtesy of its centrality to Polynesian practice and belief, making water move naturally onscreen, long a CGI challenge, was well and truly met and conquered. There is one scene near the start of the film where a toddler Moana, entranced by bright colourful conch shells that appear after she protects a small turtle’s journey from dune to waves, is first given a glimpse of her future by the ocean which pulls back, Moses parting the Red Sea style, revealing a shimmering blue world that moves around the sandlocked young girl with some luminous beauty that you gasp in wonder. This commitment to bringing the world of Moana and her people to life continues right throughout the film with the journey into the Realm of Monsters a highlight from an imaginative point of view but also from the way in which it is realised as a world distinct to itself, rich, alive and playing to its own multi-hued rules. The finale too is wondrous but that is in keeping with superior visuals that never falter, with Moana always retaining a gorgeous sheen that world-builds so perfectly that you never lose the sense of wonder and joy and deep immersion for a second. Moana is the perfect package – rich, well-sustained narrative, transportive animation, characters with whom you’ll want to spend all the time you can, a deft balance between wisecracking humour, earnest adventure, and meaningful relationship building, and quite possibly the dumbest, silliest but sweetest chicken to ever grace an animated film. And you can fully expect that come Oscars time this film will be standing front and centre, ready to be rewarded for pretty much every aspect of its production, a powerful, brilliantly-realised evocation of Polynesian culture but also of our shared human need to triumph against the odds in the pursuit of a noble and vital ideal.